Ma is a complex concept that permeates Japanese culture and informs the philosophy and design of Kurisu gardens and landscapes. Ma may be defined as active emptiness, or void. Physical, social, or related to time, ma is a void or interval that, rather than separating elements, connects them, and emerges as a focal point itself. Just as a gate's significance is found equally in the gap and the frame, ma is the activated empty space between objects, an absence that has acquired presence. Kurisu creates ma by organizing and harmonizing ki-sei in the garden. When this occurs the expressive emptiness of ma emerges. A garden may take many forms. Inseparable from the forms and features of a garden is the space created by them - the felt physical and psychological space which makes possible restorative experiences. Ki-sei is the flow of an object's energy and speaks to it's inherent qualities. In recognizing and utilizing these qualities, we create harmonious spaces. Ki in Japanese, is literally air or breath. It is often described as spiritual energy, such as the ki exercised and developed through martial arts and meditation. Sei is force or tendency. In the garden, ki-sei refers to an object's inherent qualities, and signifies direction or flow of energy. 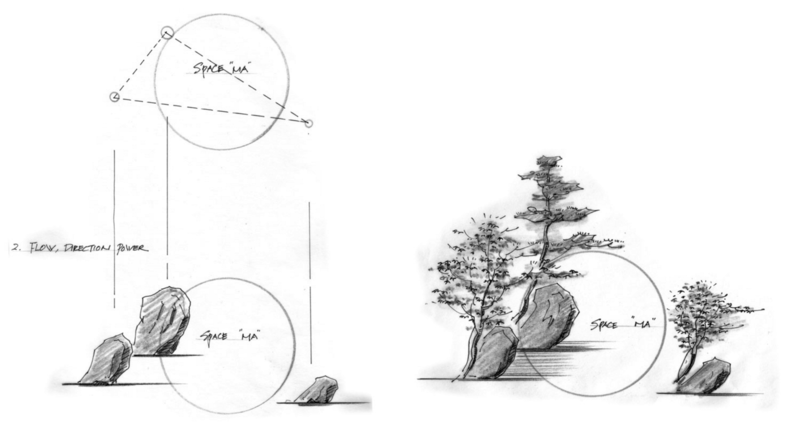 Whether a massive boulder, crooked pine tree, or shrub, every natural element contains ki-sei. Recognizing these innate qualities of each element is essential to our work. Our materials are earth, water, rock, trees. We harmonize the ki-sei of these elements to create a type of dynamic space - one tantamount to the forms that describe it.